← Flash? Who needs Flash? But .. it’s only three hours ..
Whoops. Note the system time (upper right-hand corner) versus the BIG display time (the one I actually use) .. fortunately, the alarms appear to be connected properly. I think I’ll set my night stand alarm .. just on case. 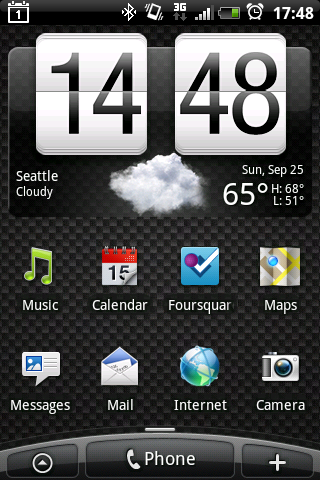 HTC Aria on ATT with 2.1. One Response to But .. it’s only three hours ..
– power cycle didn’t fix it. – changing the weather location didn’t change the clock. I removed and re-added the clock widget and it now displays the correct time.